Truck lovers across the county – and around the world, for that matter – know Ford makes the best, most powerful, most capable, most rugged, most efficient, and most dependable trucks around. From the best-selling F-150 lineup to the incredibly powerful and capable Super Duty lineup, Ford has a truck for everyone. And that includes those with commercial truck needs. 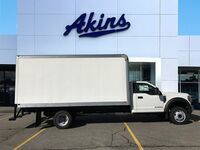 You need only look at the 2018 Ford F-550 Super Duty Chassis Cab lineup to see that – and we’ve got it all right here at Akins Ford near Atlanta, GA. The 2018 Ford F-150, F-250 Super Duty, F-350 Super Duty and F-450 Super Duty are perfect options for those who depend on their truck day in and day out. But commercial trucks are a whole different animal. 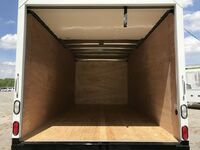 The rigorous life of a commercial truck means you need one that’s always ready for day after day of hard, back-breaking work. That’s why Ford made the new F-550 Super Duty Chassis Cab so powerful, capable and dependable. And it all starts under the hood, as you’ll quickly see right here as we take a closer look at the impressive powertrain options, features and capabilities of the 2018 Ford F-550 Super Duty Chassis Cab lineup. The 2018 Ford F-550 Super Duty Chassis Cab lineup is made up of three trim levels – the 2018 Ford F-550 Super Duty Chassis Cab XL, the 2018 Ford F-550 Super Duty Chassis Cab XLT, and the 2018 Ford F-550 Super Duty Chassis Cab Lariat. The 2018 F-550 Super Duty Chassis Cab XL and XLT give you the choice between a regular gas engine and a diesel engine, while the 2018 F-550 Super Duty Chassis Cab offers only the diesel engine option. The regular gas engine is a 6.8-liter 3-valve SOHC EFI V10 engine that can pump out 288 horsepower and 424 pound-feet of torque. The diesel engine is a 6.7-liter Power Stroke V8 Turbo Diesel engine that can pump out 330 horsepower and 750 pound-feet of torque. In terms of capability ratings, the 2018 Ford F-550 Super Duty Chassis Cab lineup has a maximum payload rating of 12,730 pounds, a maximum gross vehicle weight rating of 19,500 pounds, and a maximum gross combined weight rating of 40,000 pounds. For more on the 2018 Ford F-550 Super Duty Chassis Cab lineup, please get in touch with our staff here at Akins Ford near Atlanta, GA. 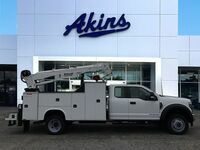 Interested in a Ford Super Duty F-550 DRW?